Marriage in North Carolina, until 1868, could be either by license or by banns (public announcement) in the county where the bride lived. It is estimated that in North Carolina two-thirds of all marriages prior to 1868 were by banns, as they were quicker and cheaper than licenses. If a marriage by license was desired, a marriage bond, which was free of charge, was procured to ensure that there was no legal impediment to the union. The bond was not proof of marriage but only of the intent to marry. The consent of parents or guardians was required if either party was under age 15 and had not previously been married. Those not wishing to bother with licenses and bonds could publish the banns on three successive Sundays and then be married by a clergyman or magistrate. No public record was made of this procedure. An act of 1868 transferred the power to issue marriage licenses to the registers of deeds and made the license the only legal public record of the nuptials. After 1851 all justices and clergy were required to return licenses for marriages they had performed to the clerk of court; these marriages were recorded chronologically in the Marriage Registers of each county, few of which have been published. Therefore, the absence of a marriage bond in North Carolina does not indicate that the couple was not married in the state, but only that there is no extant civil record of it. The percentage of extant records of marriages performed in North Carolina prior to 1868 would be generously set at 20 percent. The counties with the largest number of extant marriage bonds are Rowan and Orange. In general, marriage severely limited the rights of women. Although a single woman or a widow could buy and sell land, a married woman could not unless she held the legal status of a single woman. Additionally, from 1784 until 1868, a widow was entitled to only a life estate of one-third of the real property her husband held at his death. In 1866 the state legislature passed an Act Concerning Negroes and Persons of Color or of Mixed Blood, according to which slaves who had been living together as man and wife during slavery were now "deemed to have been lawfully married . . . at the time of the commencement of such cohabitation." Such couples could go before the clerk of court in the county where they resided, or before a justice of the peace, and legalize their union through the purchase (for 25 cents) of a marriage bond. Cohabitation bonds were also filed with the register of deeds and were retroactive, legitimizing the marriages of former slaves who had lived together as husband and wife. These bonds provided the name and age of the bride and groom, the length of time they had been married "in the eyes of God," and the names of their previous masters. The statute required that cohabitation bonds be registered prior to 1 Sept. 1866, and most were. These records are enormously important to persons searching black or mixed races. North Carolina prohibited marriages of mixed race from 1715 until 1976. Common-law marriages, in which couples are considered to be legally married merely through a long-term commitment and without a license or any ceremony whatsoever, are not recognized in North Carolina. Public laws of the State of North-Carolina, passed by the General Assembly [1865-1866], North Carolina Digital Collections: http://digital.ncdcr.gov/u?/p249901coll22,177317. Common-Law Marriage in North Carolina: A Study in Legal History, by John E. Semonche, pages 320-349: http://www.jstor.org/stable/844347?seq=1. Overview of the Marriage Bonds Filed in The North Carolina State Archives. N.C. Office of Archives and History. http://www.ncdcr.gov/Portals/26/PDF/findingaids/Circulars/AIC15.pdf (accessed November 1, 2013). 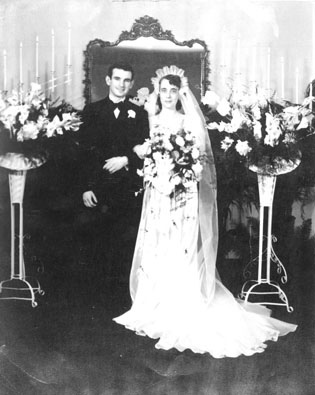 William Hutchins, Hildred Ruffin, wedding photo, 1945. From General Negative Collection, North Carolina State Archives, call #: N_97_4_331. Available from http://www.flickr.com/photos/north-carolina-state-archives/4274416116/ (accessed November 19, 2012). Thank you so much for sharing NCPedia. I believe you can just use the URL for the page to post it to Facebook.